adidas is proud to announce the introduction of the Stan Smith Limited Edition Watch in celebration of the re-launch of the iconic Stan Smith shoe in 2014. Stan Smith, renowned as a true tennis legend, remains one of the most respected and admired names in tennis. The 70's inspired limited edition watch features a stainless steel case with crisp white dial and ceramic top ring. Intricate details such as Smith's signature and the subtle call out of "15", "30," "40", and "love" in green on the inner case pay homage to heritage of tennis, while the interchangeable strap is constructed with the same leather as the Stan Smith Shoe. An additional silicone strap is embossed with a perforated pattern that mimics the sole of the shoe. With the limited production of 500 pieces, the dial is accented with edition number as a reminder of the exclusivity. 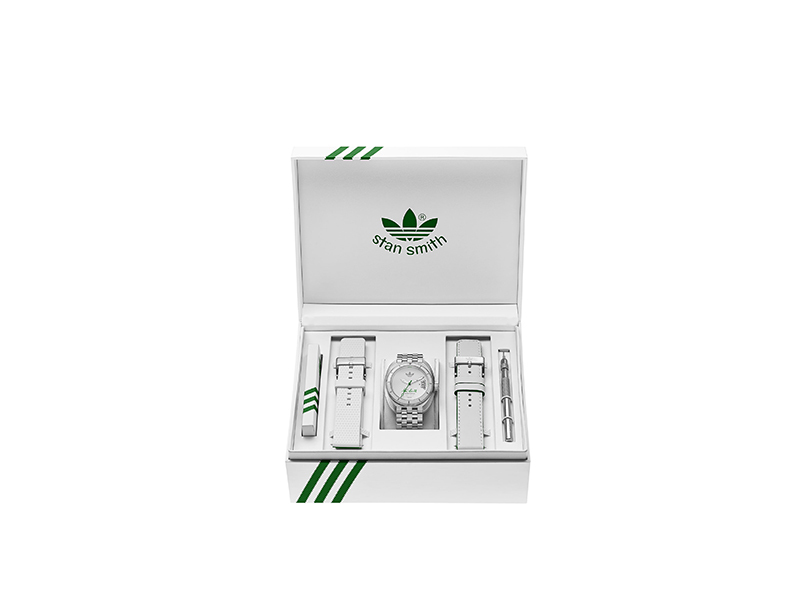 The Stan Smith Limited Edition watch is presented in a white collector's box, with two interchangeable straps, and a Stan Smith inscribed strap changing tool. Instore on 30 November 2013 at selected global Consortium doors and adidas stores and retailers.